Photo: J. C. Wilson House, ca. 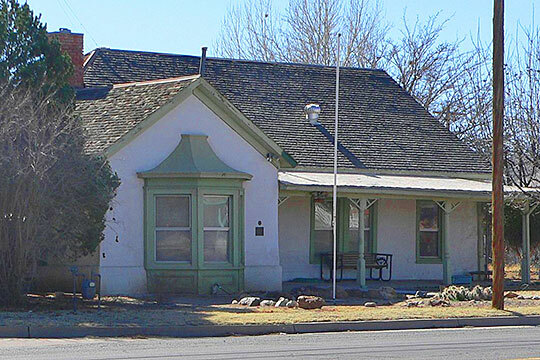 1900, 258 East Maley Street, Willcox, AZ. Listed on the National Register of Historic Places in 1987. Photographed by User:Ammodramus (own work), 2012, [cc-by-1.0 (creativecommons.org/publicdomain/zero/1.0/deed.en)], via Wikimedia Commons, accessed June, 2015. Cochise County administrative offices are located at 100 Quality Hill Road, Bisbee, AZ 85603; phone: 520-432-8500. Cochise County was created in 1881 from part of Pima County. The City of Tombstone served as county seat until 1929 when it was moved to Bisbee. In Tombstone (founded in March of 1879), the December 1879 Gunfight at the O.K. Corral is arguably the most famous gunfight in the history of the American Wild West.